Patty and Everett Gray were recently named one of ‘Remodeling’ magazine’s Big50 remodelers nationwide. They say it wouldn’t have been possible without the DreamMaker franchise. 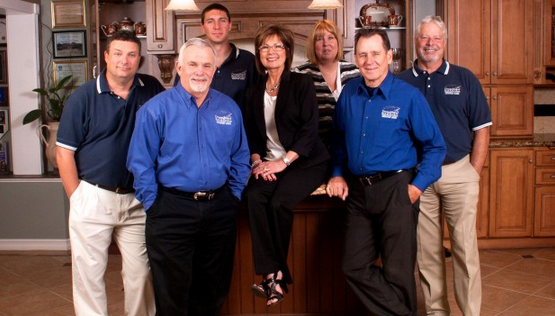 The team at DreamMaker of Bakersfield, which was recently named to Remodeling magazine's Big50 remodelers list. 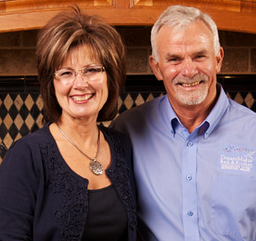 Patty and Everett Gray had run a successful construction business in Bakersfield, CA, for 20 years before joining the DreamMaker Bath & Kitchen franchise. “When we came in, as a remodeling company, we were probably a 6 out of 10,” Everett says. DreamMaker’s systems have helped them move to the next level — they have received a string of accolades, including being voted Kern County’s favorite contractor for two years in a row by readers of the Bakersfield Californian and being named to Remodeling magazine’s Big50 list of exceptional remodelers nationwide. Patty: Prior to DreamMaker, Everett was running Everett Gray and Sons Construction in Kern County, doing new homes, roofs, foundations and remodeling. Everett: I started my career as an apprentice with the Carpenter’s Local Union of Norfolk, VA, in 1972 and earned my Journeyman Carpenter Certificate there. In 1978, we moved back to Kern County, which is where Patty is from. I have been a California State Licensed General Contractor since 1983. How did you find out about DreamMaker? Patty: They contacted us. At first, we weren’t really interested because we already had a lot of experience, but they kept encouraging us to take a look. Everett: We saw the Code of Values and said, “If these guys are telling the truth about living by these values, then this is a very good company.” Well, we discovered that they were real values that they live by, and that’s when we decided to get on board. How have they helped you improve your business? Everett: I was basically a handshake contractor until we joined DreamMaker. They got me to start doing written contracts. Patty: My husband ran a great business with a great reputation, and he was extremely knowledgable. But when we bought DreamMaker Bath & Kitchen we put DreamMaker’s systems in place, which included having a showroom. Before, our office was in our home. Having the showroom stepped us up a whole lot of notches as far as how people saw our professionalism. Bakersfield quickly embraced the name DreamMaker Bath & Kitchen, and our franchise was soon outproducing our construction company. What sets DreamMaker apart from other remodelers? Patty: What really sets it apart are the systems and the Code of Values. Everybody is on the same page as far as how we treat one another and how we treat our clients. Everett: We have customers tell us that we came in as contractors and we left as friends. Customers like that we are on time and on budget. The systems for planning make a big difference. If you know much about construction, you’ve probably heard nightmares about everything being a change order. That’s why many projects drag on and go over budget. Well, we don’t like change orders any more than our customers. They slow us down. We do careful planning in advance, and it helps things move along at a very steady pace. DreamMaker brought us the systems to be able to do that. As far as I know, we are also the only remodeler in town that does a design retainer agreement before we start the work of designing the kitchen and building a complete estimate. A lot of contractors provide free designs, but it doesn’t have a lot of value because it involves a lot of guessing and there’s not a lot of time that goes into it. It’s more of a box-store mentality in terms of the design you see. We provide a thoughtful, professional design. If you go to an architect and ask them to design a house, they are going to charge you for that design work. We are design professionals, just like the architect, and it makes a big difference in the end result. You’ve won numerous awards — Best of Bakersfield for remodeling, regional CotY awards from the National Association of the Remodeling Industry, and recently named to “Remodeling” magazine’s Big50 list for 2014. What makes you stand out? Patty: We have great people. We have more than 150 years of combined remodeling experience, and our youngest son, John, is a brilliant designer whose designs have won us accolades. We also have an interior designer that we work with as a subcontractor, and we all share ideas. There is a lot of creativity that flows among several people. Everett: We don’t try to pretend that anybody here is the smartest guy in the room. It’s a team effort to get the customer exactly what they are wanting so that it is functional, beautiful and convenient. What do you like about your customers and the work you do in their homes? Everett: What I like about remodeling is I get to go into a house that is 20 to 35 years old, and it is sort of an ugly duckling, and we can turn it into a swan. New home builders tend to take shortcuts to keep their pricing competitive, and what you see 20 or 30 years later is that the house is showing some wear. There are things that people have wanted to change for years, and when their kids leave the house and they have a little more money, they are ready to make changes. They don’t want to move because their home is so full of memories, but they want it to be nicer. We ask them to tell us about their dreams, and I enjoy producing that dream for them and creating a wonderful space where they can share more good times. Patty: Kitchens, especially, are the gathering place of the home. There are a lot of memories there. Our tagline is “Enhancing lives. Improving homes.” Our first goal is to enhance lives. You don’t do that by taking a cookie-cutter approach, but by finding out what they need, what they will really enjoy and what will make them comfortable as they go about their daily activity. What qualities should a good DreamMaker franchisee have? Everett: I think they should have a servant’s heart. Is that common among the franchisees? Patty: There is no greater group of people than the franchisees at DreamMaker Bath & Kitchen. There is such camaraderie and depth of character. It’s just such a blessing to us. We absolutely love the people we are rubbing shoulders with in the organization. Everett: It’s sort of amazing. You find yourself around people who have quality in mind, who care about others, who have a team spirit. One of the keys is thinking every day, “How can I serve the client better?” Somehow the Lord happened to sift it out so that the right people have landed with DreamMaker on their shirt. A new kitchen courtesy of the DreamMaker Bath & Kitchen franchise in Bakersfield, California. What should people know about the leadership and support staff at DreamMaker? Patty: Well, Doug Dwyer is an excellent leader. There are no smokescreens. They are what they say they are. We receive excellent business coaching, and they are continually looking at new ideas and improving systems. They work hard, and they have put us on the national map. They deserve a lot of credit. I don’t think we’d ever have been part of the “Remodeling” Big50 if not for us being part of that national network. It’s a wonderful organization. Everett: The nice thing about DreamMaker is you have all these franchises with great creativity all over the country, and those ideas go back to Waco and are shared. We feed off each other. How has the peer networking helped you? Patty: It’s wonderful, especially for marketing ideas. We play off each others’ creativity on a consistent basis. Everyone is so giving and invested in each others’ success. Everett: It’s not like we’re all in the same town and fighting for the same client. Each of us knows that as we can improve the brand, it’s that much better for all of us. I can’t wait until the reunion (an annual gathering of DreamMaker franchisees and corporate staff). When we go, it’s like a retreat. Spiritually we’re nurtured, professionally we’re nurtured, and personally we’re nurtured. They are just great people. How do you enhance lives? Can you share an example? Everett: The big big jobs that involve a lot of glamour and beauty and “wow-factor” and gadgets are fun, but it’s not the size of the job that’s important. It’s how you are able to help people change their life. Not long after we joined DreamMaker, we met a gentleman whose mother was 83 years old and was no longer able to bathe herself because she was afraid she would lose her balance trying to step into the tub. Of course, she didn’t want to leave her home and go to a nursing home, and she had pets that she loved and wouldn’t be able to take with her. Well, I was able to widen her doorway so that she could navigate the bathroom more easily with her walker, and I installed a new shower that only had a 1-inch step, so she could easily get into the shower. I saw her son for several years afterward at home shows, and every time I asked him, he said his mom was so happy to still be in her home. He was happy, too, because he lived just down the street and could easily visit her. We provided a service that allowed her to stay where she wanted to be. Patty: Sometimes the service we provide is helping people realize that now is not the right time to remodel. I meet with most of our customers the first time they come in, and there are times when I have convinced people not to remodel because they would be taking on too much debt. It’s our job as professionals to do the best thing for our customers. If they can leave with the right solutions, that is the best thing. That’s what motivates us, and I can say that for the rest of the organization, too. And it makes a big difference when people come through the door and they know they can trust you. Would you recommend a DreamMaker franchise to someone else? Patty: Absolutely. 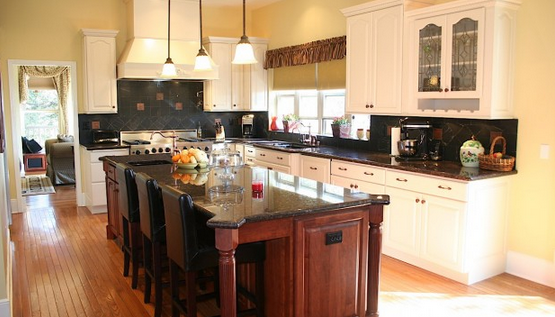 If you are a successful remodeler, they can make you better. Everett: When we came in, as a remodeling company, we were probably a 6 out of 10. They polished us up to a higher standard that took us to the next level.